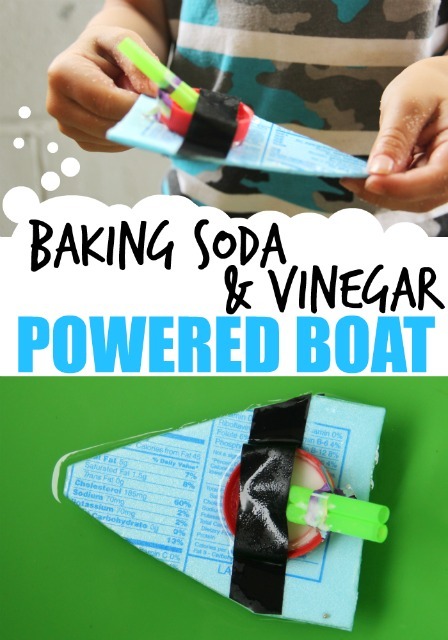 This baking soda and vinegar powered boat was such a fun way to build and explore movement powered by science. My kiddos and a nephew built this boat using recycled materials, (a lot like we did last week with our evaporation experiment). This boat required a baking soda and vinegar reaction to power movement across water. 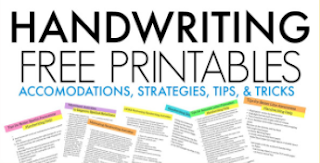 It's the perfect outdoor STEM activity! 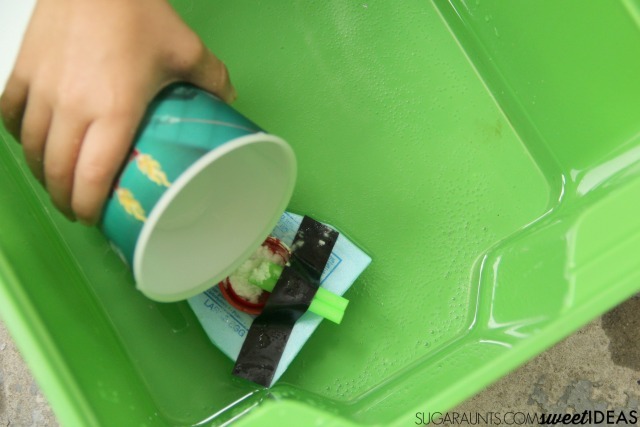 My kids LOVE baking soda and vinegar reaction STEM activities. They've tried a rocket and volcano so I knew they would love this boat activity. This recycled boat was pretty easy to put together. We a recycled used Styrofoam egg carton to cut a triangular shape. To that, we taped a plastic lid. 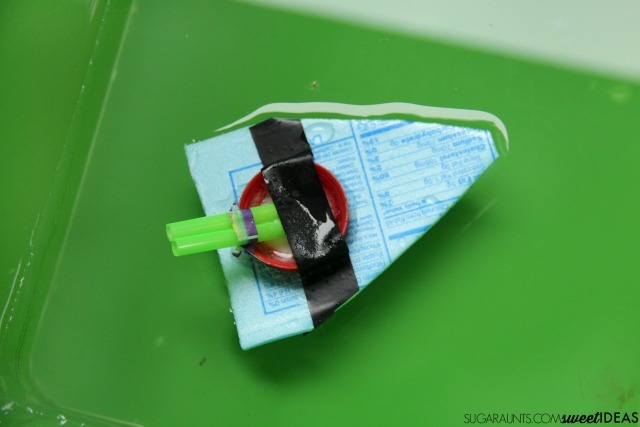 We used two small pieces of straws and taped them to the back of the boat and coming from the lid. With that, our boat was ready for power. A tip for the boat construction: Be sure the straws are taped securely in the lid and parallel to the water surface. We used electrical tape for this job. Next, fill the lid with baking soda. We have this HUGE bag of baking soda and love it. 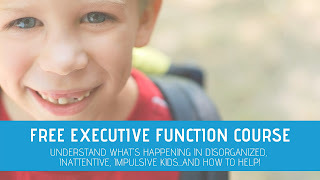 The quantity is perfect for experiments that kids want to do over and over again. Carefully pour in vinegar and watch the boat sail across the water. We noticed that our first run was the best and we think it was because the straws were better positioned at the start of our STEM activity. We also tried aiming the straws down into the water and that seemed to help with powering movement, better too. 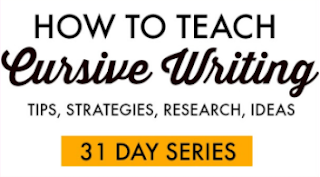 This post is part of the 31 Days of Outdoor STEM series. Stop by and see all of the STEM fun! 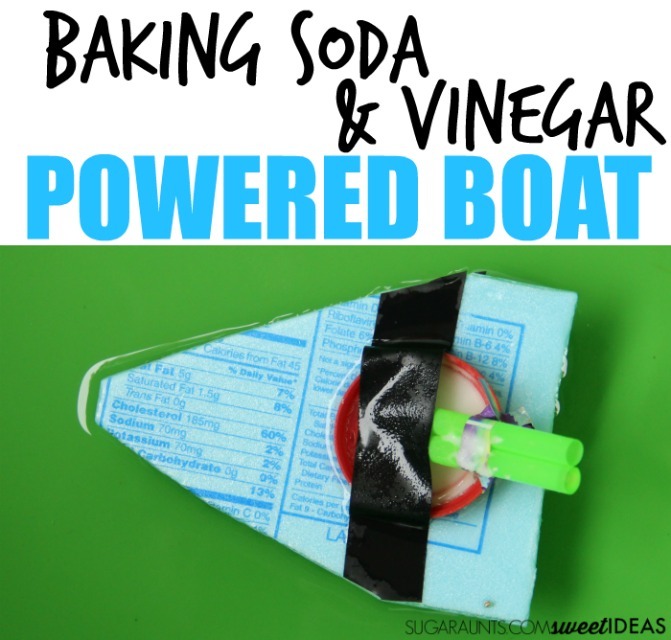 Let us know if you make a baking soda and vinegar powered boat!